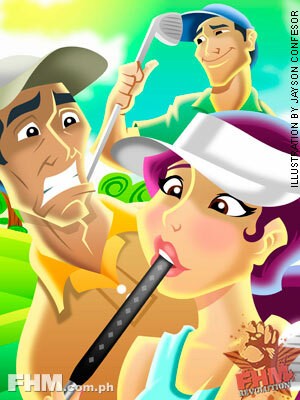 A husband and wife love to golf together, but neither of them play as well as they would like, so they decide to take private lessons with a pro. The husband has his lesson first. The pro sees the husband’s swing and says, “No, no, no! You are gripping the club way too hard!” “What should I do?” asks the husband. “Hold the club gently,” replies the pro, “just like you’d hold your wife’s breast.” The husband takes the advice, takes a swing, and—pow!—he hits the ball 250 yards straight down the fairway.